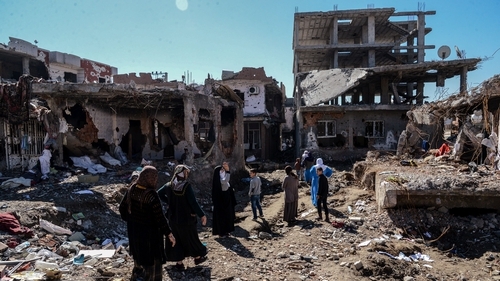 The United Nations has accused Turkish security forces of committing serious human rights violations during operations against Kurdish militants in the southeast of the country since July 2015 when a ceasefire in the region collapsed. A report from the UN rights office details evidence of "massive destruction, killings and numerous other serious human rights violations committed between July 2015 and December 2016 in southeast Turkey" with "government security operations" displacing up to 500,000 mostly Kurdish people. "Government security operations" have impacted more than 30 towns and displaced between 335,000 to half a million mostly Kurdish people, the report further added. The outlawed Kurdistan Workers' Party (PKK) has waged an insurgency against Turkey since 1984, although violence was contained during the truce agreed in 2013. But fighting resumed when the ceasefire collapsed in summer 2015. Satellite images of areas affected by the latest unrest "indicate an enormous scale of destruction of the housing stock by heavy weaponry", the report said. In Cizre, a mainly Kurdish town on the Syrian border, residents described the devastation of neighbourhoods as "apocalyptic", the UN said. In early 2016, nearly 200 of the town's residents, among them children, "were trapped for weeks in basements without water, food, medical attention and power before being killed by fire, induced by shelling," it said. The allegations come at a sensitive time for the Turkish government which is gearing up for a controversial April referendum on whether to create an executive presidency that would expand President Recep Tayyip Erdogan's powers. UN rights chief Zeid Ra'ad Al Hussein criticised Mr Erdogan's government directly, saying he was "particularly concerned by reports that no credible investigation has been conducted into hundreds of alleged unlawful killings." "Not a single suspect was apprehended and not a single individual was prosecuted," Mr Zeid said in a statement. So far, Mr Erdogan's government has not agreed to any requests from the UN rights office to visit the areas affected by the anti-PKK operations. More than 40,000 people have been killed in the conflict between the military and the PKK, which seeks greater rights and autonomy for Turkey's Kurdish minority. The insurgent group is a proscribed as a terrorist organisation by Turkey, the European Union and the United States.